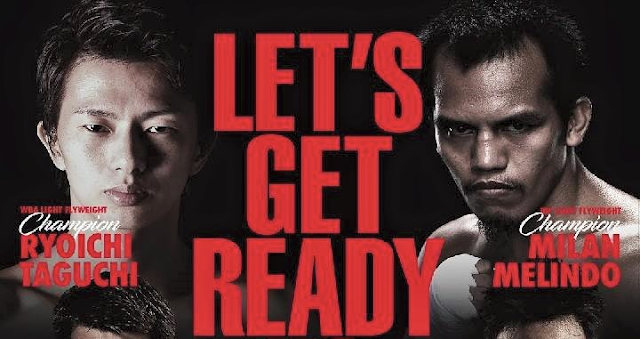 IBF World Light Flyweight champion Milan Melindo takes on the Japanese WBA Super World Light Flyweight champion on December 31, 2017. This fight will be held at the Ota-City General Gymnasium, Tokyo, Japan. Ryoichi Taguchi never been defeated since 2013 and was able to maintain his title for almost 3 years, his fight against Melindo will be the toughest test in his career. Melindo with a nickname "Metodico" means a technical fighter is the current IBF World Light Flyweight champion, defeated twice for a title fight but this year finally got his dream to become a champion after beating Akira Yaegashi via 1st round TKO. This is also a fight that Melindo needs to win if he wants to become a superstar. Melindo is a fellow ALA Gym fighter of Jason Pagara who had been defeated recently by Hiroki Okada of Japan via 6th round TKO.